"Panic, as a health officer, sweeping the garbage out of Wall Street." On September 19, 1873 the nation plunged into the longest and most severe economic depression up to that time. Thousands of businesses, large and small, went bankrupt, and the human toll was immense: fully a million workers were unemployed by 1874, and in some cities, unemployment levels reached 25 percent. The depression delivered a fatal blow to Reconstruction, as northern businessmen shifted their attention away from the rights of African Americans. It also nearly destroyed the labor movement, as pre-depression wage gains were erased and union membership plummeted. 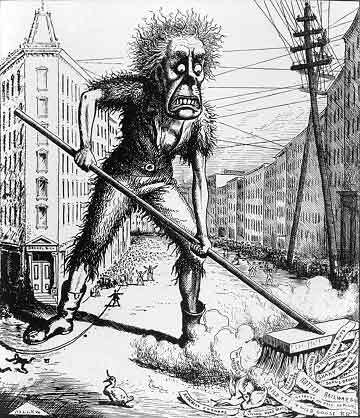 Despite the ghastly appearance of the figure representing financial panic, this New York Daily Graphic cover cartoon of September 29, 1873, subscribed to the belief that such financial “busts” cleansed the economy, weeding out inefficient businesses and allowing the strong to survive. Source: Frank Bellew, New York Daily Graphic, September 29, 1873—American Social History Project.